They look like objects you’d find in any workshop or machine shop scrap bin. They are obviously manufactured. 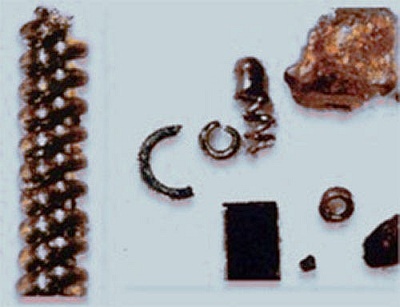 Yet this assortment of metal springs, eyelets, spirals, and other metal objects were found in layers of sediment dated to be up to 100,000 years old! There weren’t many metal foundries in those days. Thousands of these things — some measure as small as 1/10,000th of an inch! — were discovered by gold miners in the Ural Mountains of Russia in the 1990s. Dug up from a depth of 3 to 40 feet in layers of earth dating back to the upper Pleistocene era, these curious objects could be anywhere from 20,000 to 100,000 years old.